Need an item off of Amazon.com, and need it as soon as possible? If you live in the right part of New York City, you could have that needed item delivered in under an hour. Yesterday, the company launched Prime Now, a new service for Amazon Prime members that promises same- and next-hour delivery of groceries, books, toys and more between the hours of 6 AM and midnight, seven days a week. For now, the service is only available in the area around Amazon’s new building on 34th Street that’s acting as a hub for the new service. To place a same-day delivery order, you’ll need to download the Prime Now app (for iOS via the Apple App Store and for Android via Google Play). “Tens of thousands of daily essentials” are available for purchase. Two-hour deliveries are free for Prime members; requesting a one-hour rush delivery will cost you $7.99. 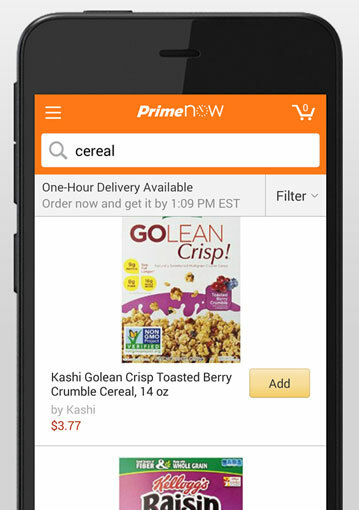 Amazon’s Prime Now offering is not the company’s first attempt at promoting same day delivery. In 2000, the company invested $60 million in Kozmo.com, a dot-com startup that offered same-day delivery of books, DVDs, Starbucks coffee and food in a handful of major U.S. cities for a similar fee. The unprofitable Kozmo went out of business in 2001, but arguably, the world wasn’t quite ready for it yet. Total e-commerce sales were just $27.56 billion in 2000, as compared to this year’s expected total of $1.5 trillion. More demand means a better chance at profitability. Amazon Prime Now is a service that’s custom built for cities. So if you live in a major metropolitan area, Prime Now may soon be available in your area. If you live out in the country, meanwhile, your odds of seeing same-day delivery are pretty slim. Thankfully, you can have the Amazon Prime Now app automatically alert you when same-day delivery is available where you live (or work). You can learn more about Prime Now by visiting the amazon.com/primenow landing page or by watching the short promotional video below.